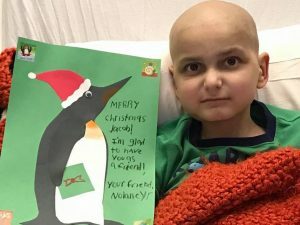 In an emotional laden message, a 9-year-old Jacob Thompson who has been struggling with stage 4 high risk neuroblastoma since he was 5, whose doctor at the Barbara Bush Children’s Hospital made it known that the boy only has one-month chances of survival, had requested the world to send him holiday cards to cheer him up for celebrating his last Christmas earlier. 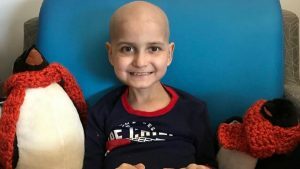 The doctors handling his case discovered that the cancer had spread to his hip and head, and so may not survival more than one month. The first card decorated with penguin which is the boy’s favorite animal was received from a friend named Nolan on Nov.1 according to the message shared on face book by his mother, Michelle Thompson Simard. Many cards and good wishing has begun to trip in, and the big day, hospital staff has plan to transform his room in to a winter wonderland, with snow sparkling tree and a visit from Santa. Earlier in his admission to the hospital, a fund raising https://www.gofundme.com/xkcjc8 was open for possible support from friend and family. The family has since begun to prepare for the pre-funeral arrangement of their boy according to the mother. “Roger and myself have been told that we should be spending as much time as possible with him and we should start making arrangements for his passing. It is expected Jacob may pass away within the month. Today Roger and I went to start making prearrangements for Jacob’s funeral, and were sticker shocked. No one thinks about having to do this type of planning for their child and because of that we did nor do not have life insurance on him. We are asking for some assistance from family and friends to help support this”. “We understand everyone lives on a budget and if you can not donate the best way to help (other than prayers) is to pass this along on your Facebook or other social media. Jacob has touched the lives of so many, he as well his father and myself appreciate your continued support, love, and well wishes”.